Chinese poet (1892-1978). 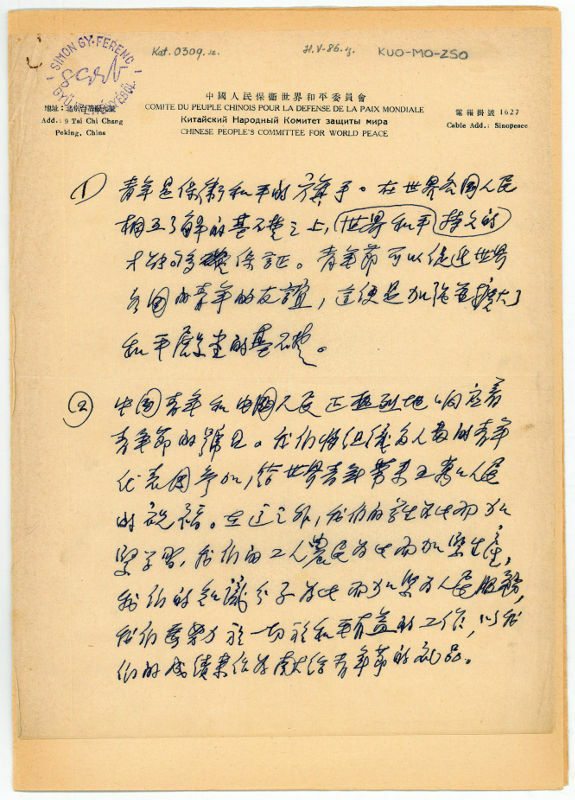 Autograph quotation. No place or date. 4to. 1 page. A fine quotation from the highly regarded Chinese intellectual, who "once called himself the Chinese answer to German Goethe and this appraisal was widely accepted. Zhou Yang said: 'You are Goethe, the Socialism New Era Goethe'" (Wikipedia). 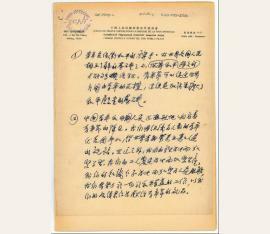 - In this particular quotation Moruo regards the young generation as the foundation for world peace and calls upon the Chinese youth to organise themselves as well as the young Chinese scientists to work for their country. - On headed paper ("Comite du peuple Chinoise da la paix mondiale"); from the collection of the Hungarian writer Simon Gy Ferenc and mounted in his original collectors map with collector's stamp.